Olympus has revealed a new close-up lighting system, claiming to be "the world's first weatherproof macro flash". Olympus has revealed a new close-up lighting system, claiming to be “the world’s first weatherproof macro flash”. The Olympus STF-8 Macro Flash is dustproof, splashproof and freezeproof down to –10°C. The twin flash system is designed to work with the Zuiko 30mm f/3.5 Macro, 60mm f/2.8 Macro and 12–40mm f/2.8 Pro lenses, and others with appropriate step-up/step-down rings. It comprises two flash heads, which have a combined guide number of 8.5, or 6 individually. The Olympus STF-8 has full automatic TTL metering as well as manual power control from full to 1/128. Photographers can set ratios between the left and right head. It is also compatible with focus bracketing and focus stacking on cameras such as the OM-D E-M1 Mark II. The heads can be rotated around the ring adapter, which attaches to the front of the lens, as well as being able to tilt 60° upwards and 40 ° downwards. As well as mounting them on your lens, you can also mount the heads off-camera for more creative effects. 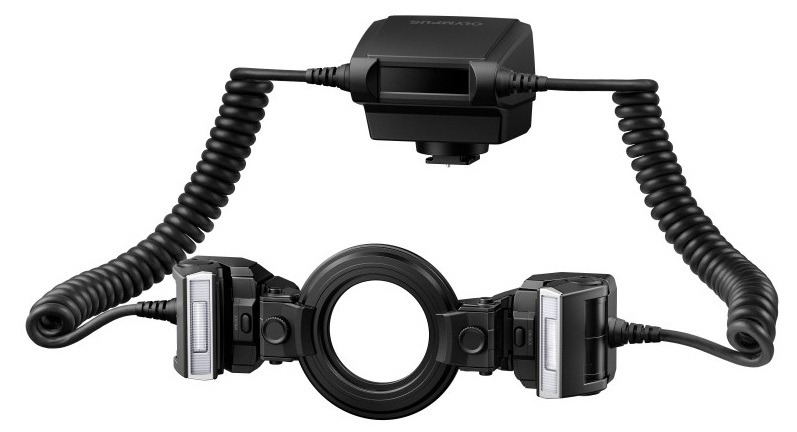 The system communicates via infrared and is compatible with the Olympus FL-900R wireless flash. The estimated retail price is $479.99, to be available in January 2017. Pre-order now at Adorama or B&H Photo.